Suppose the weather suddenly turns chilly. We could blame the weather and feel sorry for ourselves. Or we could don warm clothes and get on with our life. We would naturally choose the second option whenever the weather turns unfavorable. But we don’t choose so prudently when our emotional weather turns unfavorable, that is, when we start feeling resentful and fretful amidst difficulties. We start blaming people or things or the world at large. However, such blaming simply disempowers us – by making us feel we have been helplessly victimized by a cruel world, it submerges us in a swamp of self-pity. We have a far more empowering alternative: build our inner world and gain the strength to endure. How do we build our inner world? A time-honored way is to increase our spiritual awareness, which can become the inner equivalent of warm clothes amidst cold weather. What is spiritual awareness? The awareness that we are indestructible spiritual beings and are parts of the supreme spiritual being, Krishna. He is all-powerful and all-merciful, being the well-wisher of everyone (Bhagavad-gita 05.29). He is expert enough to bring good even out of bad. If we stay devotionally disposed towards him, our heart opens to his voice. And he gives us the grace and guidance to overcome all obstacles (18.58). Such spiritual awareness benefits us far more than warm clothes. Warm clothes can protect us from the cold at present, but they get worn out with time. In contrast, spiritual awareness protects us from our present difficulty – and also increases our overall devotional absorption in Krishna, thereby buffering us from future difficulties. And with time and practice, our absorption in Krishna strengthens, deepens and sweetens, filling us with unflappable inner security and ultimately taking us to the arena of eternal security. How does blaming the world disempower us? When life turns chilly, how does spiritual awareness benefit us more than warm clothes? Amazing article, Prabhuji. A couple of months ago, the weather in my life suddenly turned chilly. And instead of choosing to be prudent and built my spiritual awareness, I started feeling fretful and resentful. 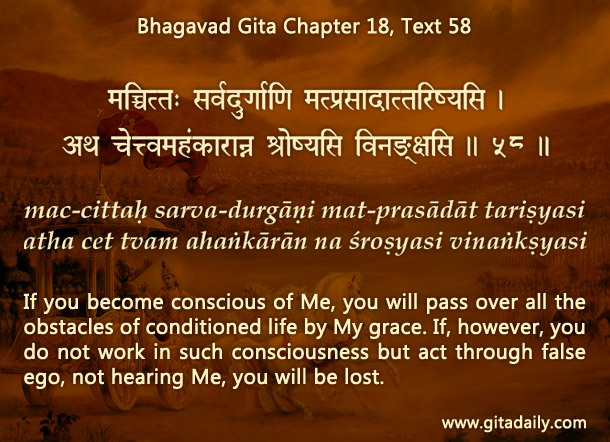 By the causeless mercy of pure devotees like you and your constant association, I was able to come out of the turmoil. Jaya! Let’s thank Krishna and pray that we all can connect with the right channels to get his guidance whenever we need it. Thanks a million. Very beneficial postings. This particular posting is so meaningful, it is worth sharing with entire humanity. I would share it wth all my contacts. Let me also request other readers of “gitadaily.com” to share with all of their contacts. Happy to know that this helped you. Thanks for sharing.